THE WORLD’S FIRST AND ONLY WINDOWS COLLABORATION DISPLAY CREATED IN PARTNERSHIP WITH MICROSOFT. Together with Microsoft, famous for introducing the Surface Hub, Avocor is building Windows collaboration displays to enhance and accelerate teamwork, increasing productivity and collaboration in the workplace. The new collaboration displays are fully compatible with Windows 10 and deliver the power and productivity of Office 365 and Microsoft Teams at room scale. Shipping now. Avocor- AVW-6555 - 5" 4K Windows Collaboration Display - 3 YR Warranty. 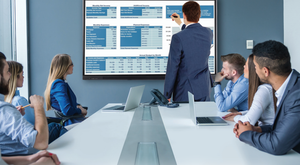 Windows collaboration displays by Avocor enable Microsoft 365 at room scale for enhanced teamwork, features a single-cable connection for seamless laptop pairing and advanced monitoring data to improve facilities and meeting ROI. The new collaboration displays are fully compatible with Windows 10 and offer a first-ever single-cable solution that solves the frustrating and often time-consuming problem of connecting devices and people in meetings. The new Windows collaboration displays by Avocor make it simple for teams to connect in a huddle space, across the conference table or even across the globe, allowing them to work together seamlessly and get more done. tvONE's C3-510-1001 is a 1RU chassis for housing components of tvONE's CORIOmaster system. The CORIOmaster delivers a more efficient approach to building videowall systems.